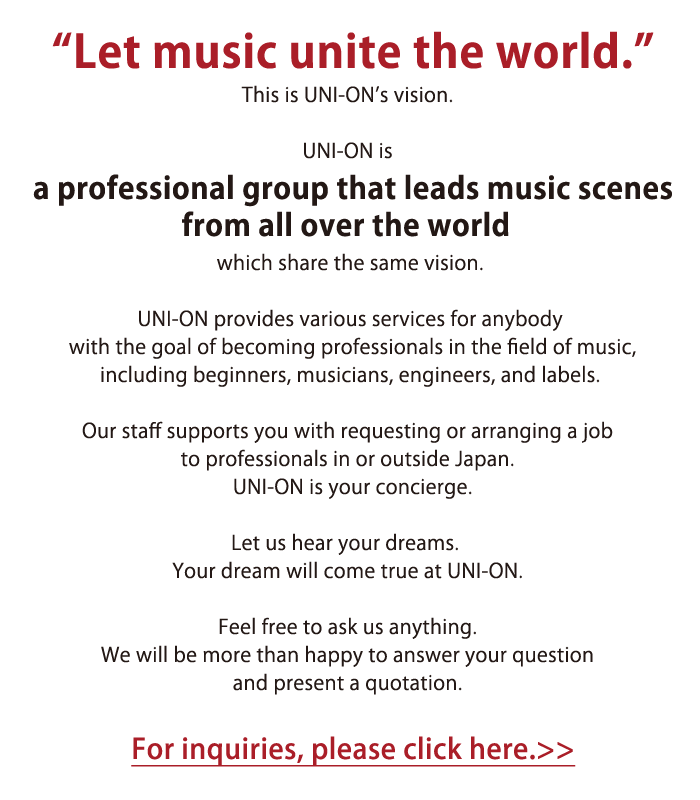 Professional engineers and musicians from all over the world are registered as members of UNI-ON. You can listen to music samples of each engineer and request a job to the engineer of your choice. You can request a recording job to UNI-ON members regardless of their location in the world. Please appoint the engineer of your preference and send us a quotation request. We will ask for details such as number of music pieces, composition of instruments, and your budget, and will prepare a quotation for you. We will also propose a recording studio location that fits your needs. We can prepare a quotation including accommodations for recordings overseas. If you don’t have any recording experience, we will give detailed explanation to eliminate all your worries. If you don’t have a particular engineer in mind, we can make suggestions according to your requirements. Beginners are more than welcome to consult with us. We will mix the music piece you recorded yourself with professional equipment and techniques. You can be present at a mixing session at a studio our engineer belongs to. Or we can mix your sound through data exchange only. You can of course request a job to engineers residing overseas. UNI-ON will be in charge of the translation of languages. Please appoint the engineer of your choice and send us the pre-mixed data. We will prepare a quotation for you. We will audio-master the source you have done 2mix on. You can be present at a mastering session at a studio our engineer belongs to. Or we can audio-master your sound through data exchange only. Please appoint the engineer of your choice and send us the 2-mix data. UNI-ON members will perform various sound processing. You can appoint an engineer, or we can refer an engineer who excels in that field. Please let us know what modifications need to be made and which engineer you would like to work with, and we will offer a quotation. We will reserve recording studios of your choice worldwide. UNI-ON will make all arrangements including transportation and accommodations. We will negotiate and reserve studios not listed on the UNI-ON on behalf of the client. Please inform us the name of the recording studio, your schedule and the engineer of your choice. You can choose the engineer you work with. We offer back-up musicians that can accompany you in various live settings. Whether it be formal recitals, music competitions, or the rock stage, our catalog of diverse musicians cover all genres and musical styles. For anything as simple as piano accompaniment or even a full backing band of professionals can be provided. We can assist you in selecting the type of musician that you are looking for. When a musician is selected we convey rehearsal times, live information, and all other relatable concerns to our cataloged musician on your behalf. We offer musicians for recording sessions. We can arrange for a musician to record the needed parts of your song, in a state of the art recording studio, and then have the data sent to you. Beforehand, we of course inform the musician of any information that you want conveyed, regarding style, feel, key-points, etc..., of the song. For example, the finishing touches of your song can be done by getting a guitarist from over-seas to record a one of kind part. Or, if your song was simply in need of a vocal line in English, we can help get the artist you are after. Because of the modern day ability for us to record virtually anywhere in the world, we can have the recorded data of an amazing musician sent to you almost instantly. We are simply the bridge that connects the artist to the client. However, amongst our various services, we also offer you the ability to expose your compositions world wide. We can have your song translated and sung in various languages for broad exposure. Furthermore, we can have your songs entered into various competitions and auditions on your behalf. If you are unable to find a musician within our catalog that suits your genre or taste, let us take care of that search for you, through our various unpublicized networks and contacts. We can assist you in selecting the type of musician that you are looking for. When a musician is selected we convey content of recording and all other relatable concerns to our cataloged musician on your behalf. Our cataloged talent incorporates various types of musicians, arrangers and composers. We can provide samples of our talent’s work for you to listen to. If there is a certain mood or theme for a song that you are after, we too can offer suggestions about how to go about enlisting the right talent. Our musicians are available for private lessons as well, whether it in the convenience of your home or in a music studio. If you are having trouble selecting the appropriate musician we will guide you through the various genres that our musicians are categorized in to. Our catalog is set up in a way that makes it easy to select the right musician according to various genres. You may browse through the various genres of catalog in order to find the musician who can lead you through a music lesson. If the musician you would like to receive a lesson from is in a foreign country, then we can arrange to have a video made of the musician’s lesson, then translated and sent to you. We can assist you in selecting the type of musician that you are looking for. When a musician is selected we convey content of lesson and all other relatable concerns to our cataloged musician on your behalf. We provide photographic services for musicians who are in need of professional photography for headshots or live performances. Furthermore, we also provide video services for live performances or otherwise. You may choose from amongst our lists of photographers and videographers to find the one of your liking. We also offer translation services for music related websites, magazines or just about anything else. When we first began our UNI-ON venture we assembled a team of translators whom specifically have a background in music or recording services, so that our products and services would be interpreted into various languages accurately. Whether it be subtitling for music videos, or translating for musical equipment; from recording software, to music websites our team of translators can accurately translate your material in a way that appeals to your target customer. We offer s service in which we submit musical compositions on your behalf to competitions based around the world. If you are a composer or producer with aspirations of success, this is one way to see if you have just that capability. However, these competitions are not amateurly orientated. You would be entering amongst many other professional composers. Furthermore, the potential for landing a hit song via the UNI-ON network is seemingly possible. Distribution of professional tutorial videos on various topics, is one of our outstanding services. Topics may range from music production to musical performance. Whether it will be tips on guitar repair or tips on how to make the bass pump in your song, all topics are led by a professional in their area of expertise. All tutorials are internationally distributed and span across various genres and themes. Copyright © UNI-ON All Rights Reserved.